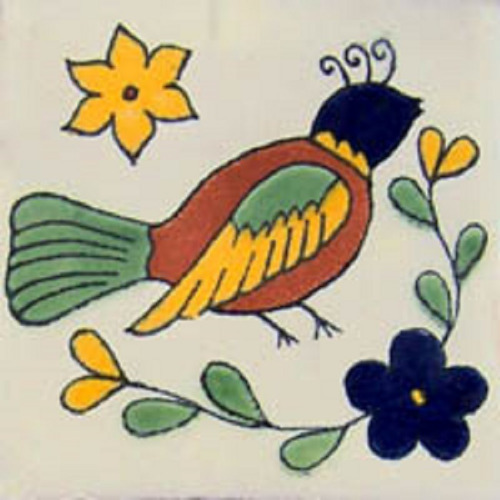 Boost your kitchen, bathroom or patio with this bucolic and cheerful design with our Mexican ceramic tile “Bird 1”. The bird and flower pattern is very unique and colorful so you can play with its blue, yellow, green and terracotta tile colors to create a perfect focal point in your décor. You can design a gorgeous rustic ambiance with our Mexican ceramic tiles. I love birds, perhaps a different specie than the one on the image but it dosen't matter. I was in process of renovating our cabin and thought tiles with a bird would be a nice accent because of the property and its nature surroundings. I have to admit it wasn't easy to find what I was looking for and when I found this Mexican tile with a bird I knew it was it. I received my tiles in three weeks time with good packaging. mexican-tile.net added a few extra tiles which I am going to use for coasters. Thank you for smooth transaction.